Batteries – chances are if you’re reading this article you’re using one. Phones, laptops, desktop computers – they’re all powered by batteries. While we rarely take notice, batteries have been a revolution. As electricity storage is impossible without them, batteries make the modern world possible. Demand for new battery tech is only expected to grow in the coming years. Electric cars will run on them. Wind turbines and solar panels will power them. A greater uptake of consumer electronics will boost demand for them. These changes have unfolded before investors eyes. Think Elon Musk installing the world’s biggest battery to power South Australia. Think of all the Aussies that have erected solar panels on their roofs. Think of all the commuters checking their smartphones on Sydney trains. A look at the data is also revealing. Sales of electric vehicles have been growing around the world at 35% a year - with particularly strong growth in China, thanks to strong government support (McKinsey, 2018). Demand for batteries in grid storage has also been growing at a mighty 40% a year, suggesting what Musk did in Adelaide is just one part of a global trend. Demand from consumer goods like smartphones and power tools continues to grow at a steady 8% a year (Albermarle, 2017). 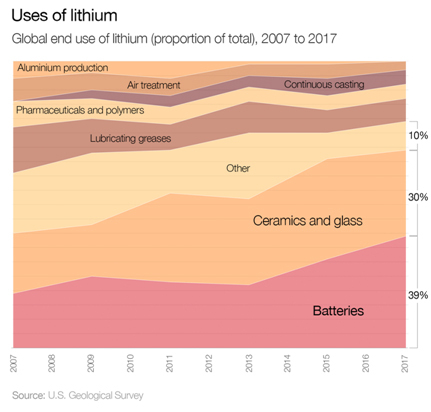 The rise of batteries has brought with it a renewed interest in lithium, too. Lithium may be an obscure element, forgotten by most investors since high school chemistry. But batteries have meant it is recapturing investors imaginations, as lithium allows batteries to recharge many times over without blunting capacity. Yet investors with a view on batteries and lithium have been short of options. 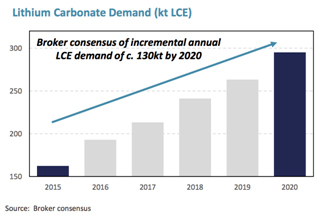 The obvious answer to investing in lithium may be to buy lithium mining companies. Yet investing in mining companies has its own risks. Mining companies are volatile, only give exposure to supply side dynamics and buying a single mining company comes with company-specific risks. Those interested in betting on wider use of battery and new battery tech run into similar constraints for the simple fact that picking stocks is hard. A bet on Tesla late last year would have cost investors dearly. No-one in 1993 would have known that Sanyo, now owned by Panasonic, would still be the world’s largest battery manufacturer 25 years later. Fortunately, however, for anyone wanting exposure to this nascent sector, there is now an easy one-stop-shop option available. The new ETFS Battery Tech and Lithium ETF (ACDC) offers investors highly diversified exposure to battery technology right across the value chain. From Chilean lithium miners like Quimica, to companies offering grid storage solutions such as Toshiba and Nissan: any companies that are likely to benefit from growing demand for battery tech are stuffed in the fund. ACDC does this by tracking an index called the Solactive Battery Value-Chain Index. The index uses US Department of Energy data to figure out which companies are making and developing battery tech. The index has returned 15% a year since 2013, our back tests indicate. Over that period, batteries have bloomed and grown from being used in batteries toused in cars to being used in power grids. Charging just 0.69% ACDC allow investors to take a positive view on the future growth of the battery sector.